Lately the biggest hits to my blog were from people checking out pics of my tattoos. This is better than all the hits I used to get from people checking out the picture of Jason Lee and the My Name is Earl logo. But I do worry--am I going to go to a party one of these days and run into some random stranger with the EXACT same tattoo? It would be awkward to show up wearing the same dress, top--even shoes. The same tattoo would be more than awkward. My review of the King of California soundtrack has been very popular--210 hits to date! Other heavily trafficked pages include my post about the GAP class action suit and the poetic tribute to deceased Desperate Housewife character Ida Greenberg by Karen McCluskey. We are an eclectic bunch here, aren't we? 1. How did the other mental patient see Charlie? Several possibilities: One, he is a MENTAL PATIENT after all. Maybe he's always seeing things. Two, the other mental patient didn't specifically point to Charlie--he just told Hurley someone was staring at him. When Hurley looks over, he sees Charlie. But if you check out the screencap at Lost Easter Eggs, there is another in the background that he could have been referring to. And finally, maybe Charlie IS visible. He does tell Hurley, "I am dead. But I'm also here." 2. Who did Sayid shoot on the golf course? 3. Why should Hurley have stayed with Jack? We don't know yet. Perhaps something bad happened to the Locke group that wouldn't have happened otherwise. Or he felt bad about his self-perceived disloyalty. 4. Was Pierce Brosnan on the LOST episode "Confirmed Dead"? Um, no. You may have mistaken the scruffy Daniel Faraday (portrayed by Jeremy Davies) at the beginning of the episode for a scruffy Brosnan. But the former Bond boy did not make an appearance. For all LOST related question, check out Lostpedia. Everything--and I do mean EVERYTHING you ever want to know about LOST is on that site. 1. What actress played Fay Summers? The character of Fay Summers was killed in a car crash prior to the beginning of the series. But the few recent flashbacks look to me like Becki Newton in a "Fay Summers" wig. Becki's character of Amanda Tanen is, after all, Fay Summer's illegitimate daughter so there would be a resemblance. Renee (played by Gabrielle Union), aka "Rhonda", is Wilhelmina's (aka "Wanda") younger sister. 3. What food do Henry and Betty eat on their first date? Hmm--if by their first date you mean that lunch date they went on at Halloween (Betty was dressed up as a butterfly and still dating Walter), then the answer is sushi. I'm not sure what this googler was searching for--but interestingly enough, when I was reading The Other Boleyn Girl, Philippa Gregory made numerous mention of Anne Boleyn's necklace--a pearl choker with a gold "B" pendant. 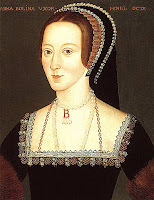 It made me think of the necklace Betty always wears and sure enough, Betty's necklace is modeled after Anne Boleyn's! 1. Which four Scavos does McCluskey love? I think Karen was joking when she made that comment, but if I had to guess--I'd say she wasn't loving Tom too much when she had to act as caretaker when he injured his back and there was a period when Kayla, Tom's daughter by nasty Nora, was a little witch and McCluskey did act incredulous when Lynette said they were friends--so that would leave Parker, Preston, Porter and Penny. 2. What did Dylan's father do? We don't know yet, but thanks to the end of the WGA strike we're getting some more original DH episodes this season so perhaps we'll get that answer. My theory: he didn't do anything. Dylan, at age six, accidentally caused his death (perhaps a loaded gun lying around the house?) and her mother Katherine and Aunt Lilly covered it up so that nothing would happen to her. She has since blocked the entire incident from her memory. Katherine's cover-up is that Dylan's father left and that he was an evil and abusive man. But Aunt Lilly wrote the truth on a piece of paper before she died--which Adam found, Katherine burned but Dylan retrieved from the fireplace. When is "Chapter Three: Villains" being televised? Bad news--due to the strike no more new episodes of Heroes until the 2008 Fall season. 1. Is Michael Clayton based on fact or is it fiction? Michael Clayton is a fictional script written and directed by Tony Gilroy based on his knowledge of law firm "fixers" and wanting to write a story about what goes on behind the scenes in that world. Here's a link to an interview he did with the Seattle Times about the script. 2. In Michael Clayton, what happens to Arthur Edens when he is injected in the toe? Arthur is injected with a substance that causes his death and makes it look like the historically unstable attorney committed suicide. They inject it in between his toes because it won't leave an obvious track mark there. Well, that was a problem wasn't it? There wasn't any aging makeup done in There Will Be Blood so although the story takes place over a 30 year time period, the actors--particularly Daniel Day-Lewis and Paul Dano didn't look as though they aged a day--as evidenced by this shot of Eli Sunday to the right, who should be in his late 40s/early 50s. Looks like a teenager still, right? 4. What's the time period of There Will Be Blood? The story begins in 1898 and spans 30 years through the late 1920s. 5. What does H. W. Plainview in There Will Be Blood stand for? We don't know. "Herbert Walker" maybe? 6. In Cloverfield, did Lilly survive? Lilly, one of the quartet trying to rescue Beth, took off in a separate chopper before the others went up in the helicopter that was smacked down by the monster. It is quite possible she survived. We may find out for sure--apparently Cloverfield may possibly have a sequel. 7. What was the Nirvana song that was played in Juno? 8. What neighborhood was Juno filmed in? Like most indie films, Juno was filmed in Canada--specifically Vancouver and Burnaby in B.C. for the most part. I found this info under the filming locations section of Juno's page on IMDB. Wikipedia and IMDB are your friends, people! 9. Was Charlie Wilson's War fact or fiction? The Tom Hanks movie was indeed based on a true story. 10. What was the name of the Barry White song Alvin played during Dave and Claire's dinner? Actually it was Marvin Gaye not Barry White and one of the sexiest songs EVER--Let's Get It On. Tomorrow I'll post answers to some more non-TV/movie related searches I get--like "How long is the Santa Monica pier?" Answer: According to its website, it's 1,600 feet long.